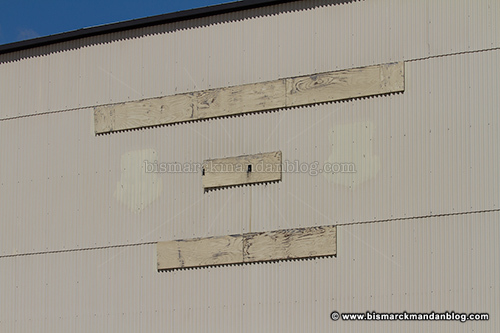 This sign on the side of one of the hangars had been removed. The photo doesn’t really do it justice as far as its size; this is an enormous sign. And it’s gone. I was actually looking forward to seeing it again. Why? 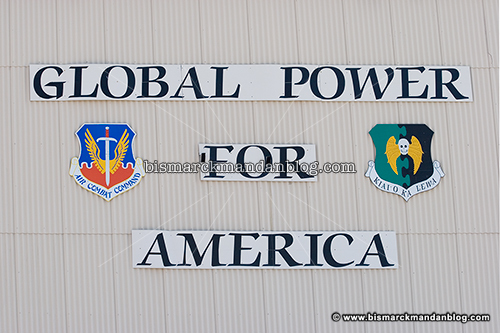 This is what it said last time I was on the base. I’m extremely proud of the mission the Air Force carries on from our beloved state, and I’m equally proud of the global presence the United States maintains as a force of stability in the world. Sadly, those things aren’t in vogue right now with the people in charge of our armed forces. It seems everything is political today, but the aggressors set the rules – and there are people in power these days that turn everything into a political issue. 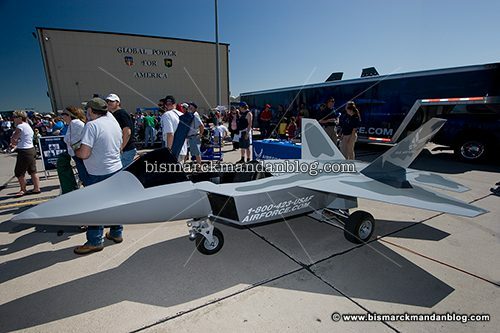 That’s why plenty of people at the show even back in 2009 were referring to this little guy as “Obama’s new fighter prototype”. It’s disheartening, actually. I hope that we can continue to elect leaders that will strengthen and equip our nation’s armed forces to do what they’ve always done: protect the United States and its allies in an ever more dangerous world. North Dakota has played a significant role in that mission, and I hope it continues to do so with well deserved pride and satisfaction. This entry was posted in Military by Clint. Bookmark the permalink.